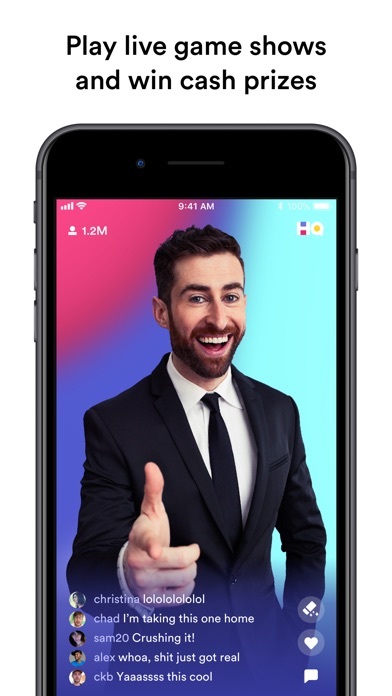 HQ is the wildly popular live game show app where you can win real cash prizes for free. 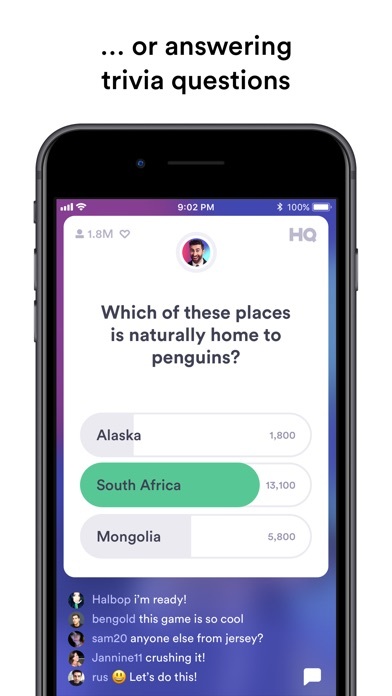 Every day, tune into HQ to answer trivia questions and solve word puzzles ranging from easy to hard to savage. 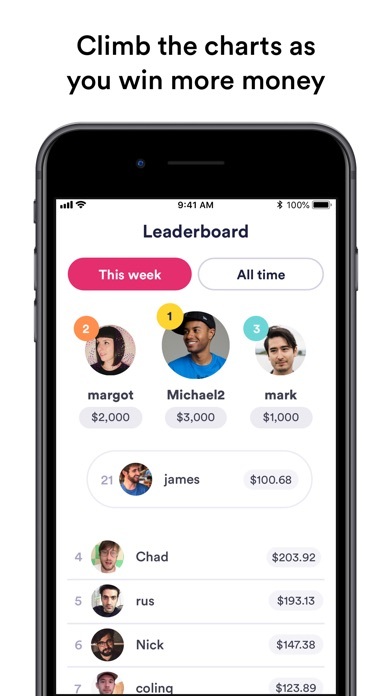 See if you have what it takes to win cash. Make sure you turn on push notifications so you never miss the live shows and your chance at the money. Invite some friends to join the fun - if they use your code, you'll get extra lives. 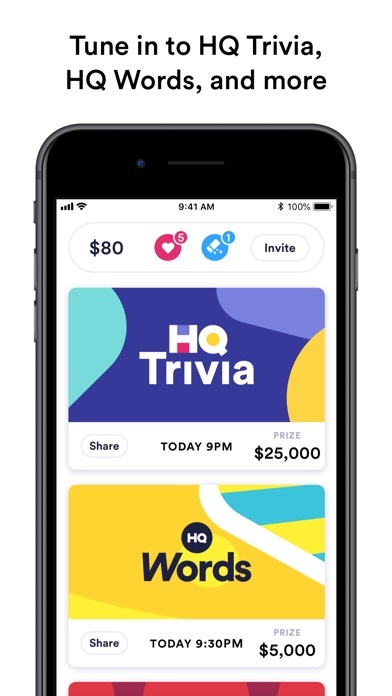 HQ has had special guest celebrities like The Rock, Robert De Niro, Gordon Ramsay, Neil Patrick Harris, and Alicia Silverstone drop in, has given away millions of dollars in prizes, and has been featured in The New York Times, The Today Show, Time, ABC, CNBC, and more. Join the future of television, and download HQ now. 9:27. Would not let me join words 4/18/19!!!!! Why? Playing the game is fun, but each game needs only 1 notification. Getting 4 notifications per game, and with Trivia and Words that can be 8 notifications in about an hour is wayyyyyy too many. There is no option in the app to decrease the number of notifications without unsubscribing to the game. Please fix this issue! App functions ok; occasionally it will freeze and kick you out but it’s mostly ok. A few times there was a glitch whereby the game would have to be restarted, but HQ was always fair about giving free “Extra Lives” in those cases. The problem is the hosting - it’s become unbearable! Scott became so full of himself that he was intolerable, so his loss didn’t hurt. Matt WAS ok (little riff on his handle!). But someone has decided to have Matt slow down the game, intentionally, and that has finally broken me! Bye! 15 minutes of watching him take drinks of water, stutter-start questions, and generally stall is just too much - especially since they’ve gone to this “Season” model with no money, only points. And everyone has the same number of points! Gah! This trivia game is way way too hard just to win a few cents!! Make it easier so the younger kids (teenagers) can WIN and feel good about themselves!! After paying for extra lives, when used, I wasn’t given a keyboard to type my letters and lost the extra life due to being eliminated for no response. Not to mention the constant freezing up of the games. Waisted my time and money, quite disappointing! It’s fun when it works. Whenever there’s a glitch and the game freezes, it kicks you off as if you got a question wrong and you can’t continue. Use to love it. Now it messages you too many times a day begging you to come play. And you don’t even win money every time now. Just points. Points are great if you can play every day. But I’m an adult. I can’t play every single day. You get rewarded if you can play everyday. But tough luck if you have a schedule that doesn’t allow it every day in a row. You play four days in a row but can’t get to the fifth day? Too bad, no extra life for you! For some reason it doesn’t register your two friends playing near you? Too bad, no eraser for you! So you start losing interest. Then you stop playing even when you can. Then the app messages you like an ex that is trying to convince you that, “this time will be different!” But it’s not. They have literally messaged me three times while writing this. Let alone the 3 messages I got that motivated me to write this 30 minutes ago. Stop it HQ! I’m not coming back! Move on! We are done!!! ARE YOU SERIOUS THEY MESSAGED AGAIN WHILE I WAS ATTEMPTING TO PROOF READ IT!!! Deleting it now! I love the app, but every now and then, there are glitches that prevent me from using power ups I’ve earned.